The SportHelo is the helicopter that makes the decades-long dream of personal flight a reality. The SportHelo is an ultralight and can be flown by almost anyone; no pilot’s license is required to fly it AND factory flight training is free. The SportHelo is NOT A KIT. It comes ready-to-fly. That’s right! Ready To Fly!!! Are you ?? What exactly is a SportHelo? 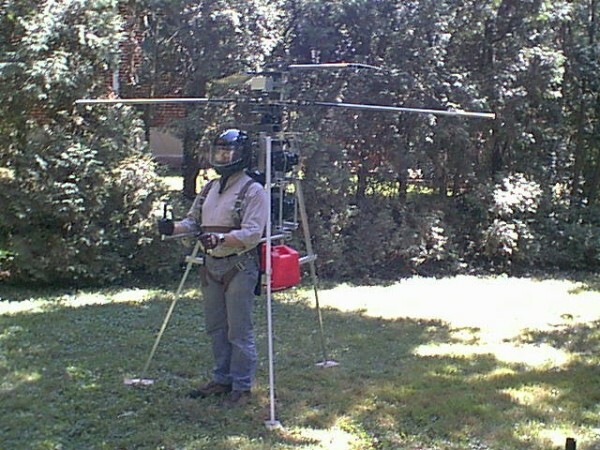 The SportHelo is a fully self-contained, ultralight, backpack helicopter. 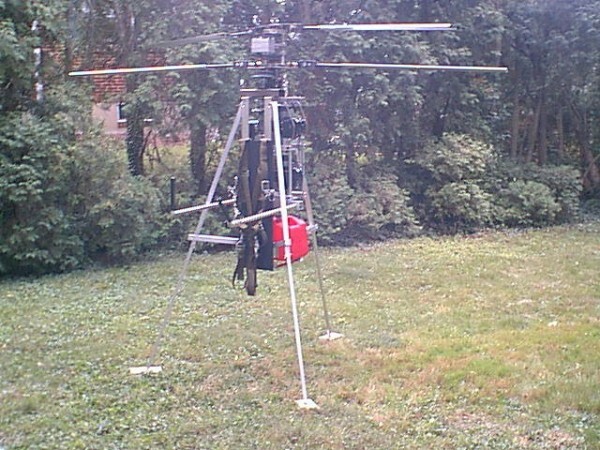 It is completely collapsible, meaning that it does NOT require any assembly when you are ready to fly. It unfolds to deploy and will take only about five minutes or so to get it into the air. 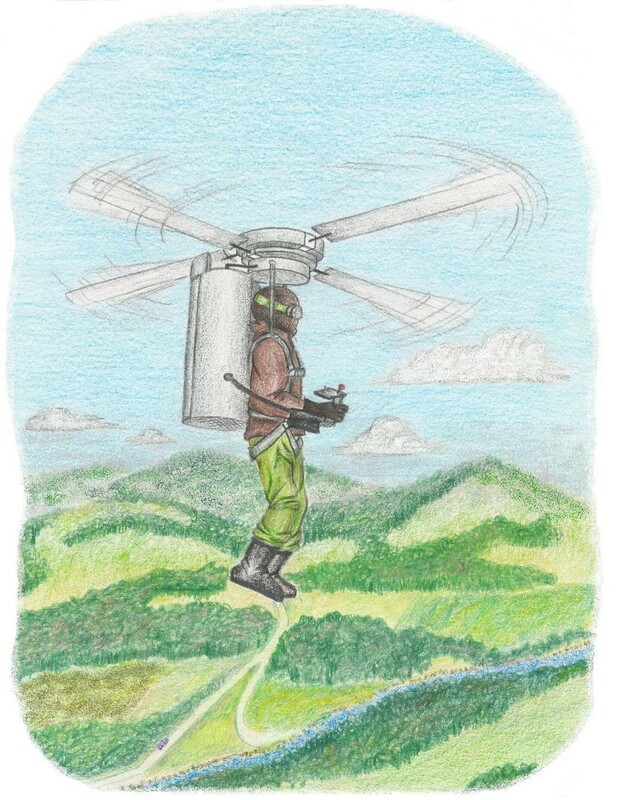 It carries 5 gallons of gas/oil-mix fuel in two 2-1/2 gallon portable tanks and is expected to have about 45 minutes of flight duration, which, at an expected forward speed of 45 miles-per-hour, should give a range of 30 to 35 miles. The SportHelo has electric start, power-retractable landing gear, conventional flight controls, complete fuel management system, and redundant electrical systems. Flight controls have been simplified, and learning to fly the SportHelo should typically take less than 20 hours of instruction time. The SportHelo is designed to be very stable, and has been designed with safety in mind; the design is redundant in many ways in order to reduce the possibility of operational failure. The SportHelo has plenty of power, and will pick up the average person plus up to 80 additional pounds of gear. Have you ever been somewhere, seen something in an impossible location, and thought, "Gee, I wish I could get a better, up-close look at that." Or, have you ever wished that you could go somewhere without all of the traffic hassles. Or even, simply dreamed of what it would be like just to fly free, out in the open, almost bird-like, and see the world from the sky. Well, now those wishes can come true! Just take a few moments to check out the SportHelo. 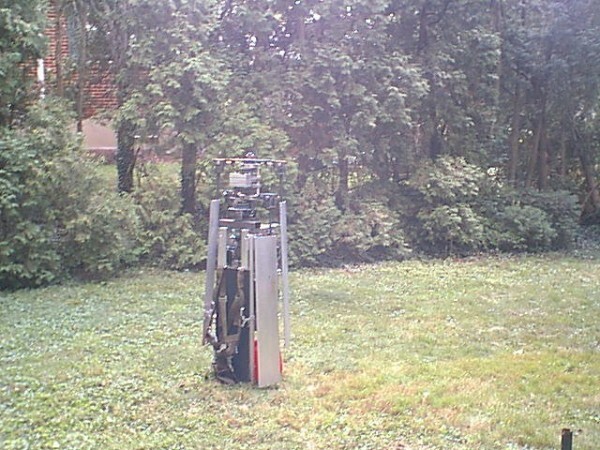 The following pictures are of the SportHelo proof-of-concept prototype. The production SportHelo will look more like the artist's rendering at the top of this page, with full covers and a more "finished" look. Yep. It really does fold up that small. This site is currently being updated. Please check back in a few days.